Don't have time to read it now? Why focus on appointment reminder frequency and timing? After all, a reminder is a reminder is a reminder, right? Of course not. Reducing the patient no-show rate remains one of the greatest points of leverage providers have to increase practice profitability by retaining and realizing planned appointment revenue. The appointment reminder simply ensures that scheduled appointments actually happen and helps reduce marketing costs to continue to acquire new patients. Another great “why” question is, “why fret over the reminder strategy?” This guide shares insights gathered using data science to analyze 20 million appointments. We'll share what we learned about when and how often patients should be reminders of their appointments. The recommended approach can be used as a starting point for an organization’s appointment reminder strategy and adjusted per the unique needs of either patients or providers. When building an optimal appointment reminder strategy, we’ll consider four types of messages: at scheduling, weekly, daily, and hourly. Let’s start by defining them. At Scheduling: Reminder messages sent to patients immediately after an appointment is scheduled, often six months or more in advance of the appointment. Now let’s look at how these different messages complement one another to minimize missed appointments. Start with a weekly message. 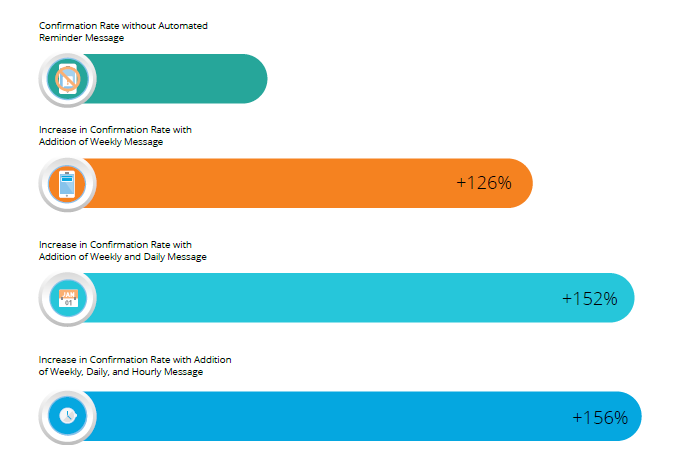 The touchpoint that has the greatest impact on confirmation rate (the percentage of patients who actively respond to confirm their attendance) is the weekly message. 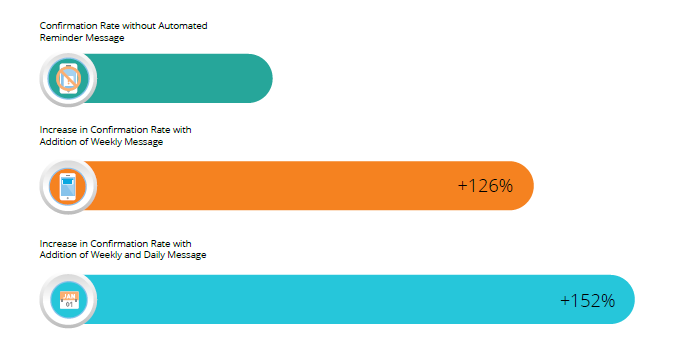 Appointment reminder strategies that include the weekly reminder message are confirmed at a 126 percent higher rate than when no automated reminders are sent—higher than daily, hourly, or at scheduling messages when they are used on their own. Add in a daily message. The daily message is also important to the confirmation rate. When combined with the weekly message, the daily touchpoint provides a lift of an additional 26 percent to the confirmation rate. Add in an hourly message. Why should you add this third touchpoint? It doesn’t measurably influence confirmation rates. But remember that this is looking only at confirmations of appointments, not whether those patients show up. It’s not as natural for us to confirm an appointment that’s only a few hours away. Instead, patients are more likely to pass on confirming and just show up. The hourly message is more of a convenience for patients than a tool to help you confirm their appointments. Given how important communication and other practice logistics are to overall patient satisfaction, this additional message is certainly worth sending to ensure patients are on time to receive the care they need. Pass on the at scheduling message. Should you deliver a reminder message at the time the appointment is scheduled? This is a message that you can go without. Because appointments are typically scheduled far in advance of their actual date and time, confirmations on these types of messages are extremely low. In fact, when added to a schedule that includes weekly, daily, and hourly, the at schedule reminder elevates confirmation rates only 0.1 percent. The weekly reminder message proves to be enough lead time for patients, especially when delivered within the recommended timing windows we’ll discuss. An exception is when appointments are scheduled within the optimal weekly range we’ll discuss next. An at scheduling message in this case ensures the patient receives a reminder even if that weekly timing has passed. So far, we’ve talked in broad terms about the nature of weekly, daily, and hourly messages. But as the definitions above suggest, what’s considered a weekly message can span roughly 21 days. Daily can mean anything within a six-day window. Let’s zero in on more specific recommended timing for each of these messages. Send the first reminder message three weeks ahead of the appointment. Patient responses to reminder messages indicate that the highest confirmation rates occur when the message is sent three weeks prior to the appointment. The confirmation rate of strategies that include a three-week message is 79 percent. 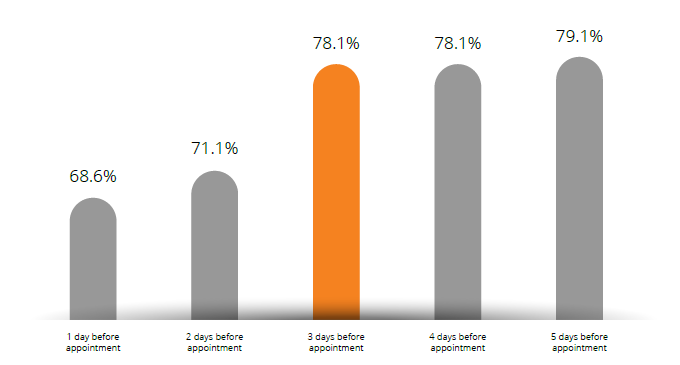 Confirmation rates dip slightly on the two-week and four-week sides of this timing, and messages sent only one week prior to the appointment are nearly 6 percent less likely to result in a confirmation from the patient. Send the second reminder message three days ahead of the appointment. Actually, the difference in confirmation rate between 3-5 days is not statistically significant. Anything in this range provides an optimal opportunity to have patients confirm. So why is three the recommendation? Since the three week message has already been sent, the appointment is likely already on the patient’s personal schedule. By sending this second message at three days, the patient is more likely to know if there will be a scheduling conflict on the actual appointment date. Pushing that message out to five days leaves a larger window for any personal schedule conflicts to arise, meaning a confirmed appointment this far out is slightly less likely to hold due to external factors. Send the third reminder message three hours ahead of the appointment. As we’ve seen, the hourly message does not have a significant impact on patient confirmation rates. Instead, it serves as a helpful day-of reminder that prompts the patient to actually attend their already-confirmed appointment. Why three hours? There is admittedly more of an art to this particular recommendation than a science, as a three-hour message makes the optimal reminder strategy easy to remember—3-3-3. Still, a three-hour lead time with the final message allows more time for patients to travel to the appointment than a message that is delivered only one or two hours ahead of the appointment. If the patient has forgotten the appointment, this three-hour window also allows additional time to arrange care for dependents and coordinate other details. 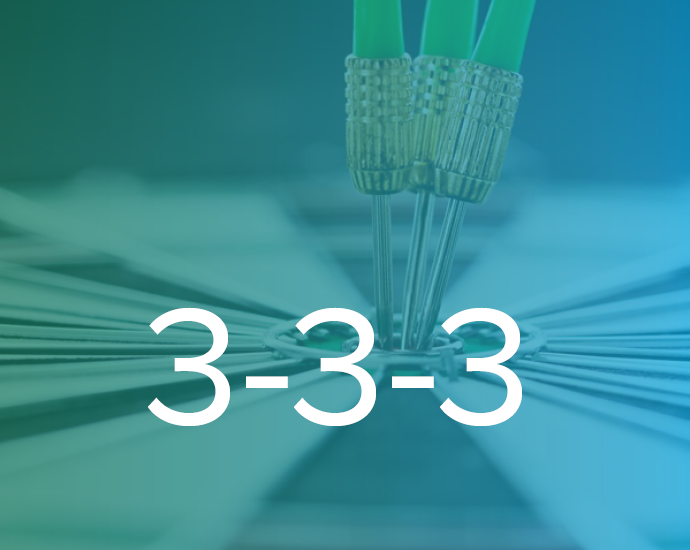 Yes, “3-3-3” does roll off of the tongue, and it’s easy to remember. But it also works. 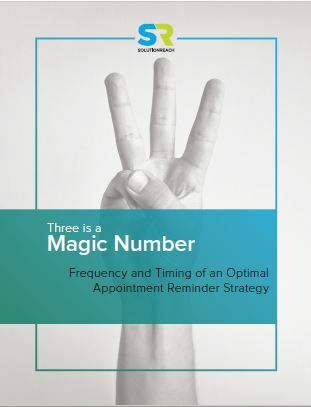 When compared to the most common timing strategies employed in reminder communications, the 3-3-3 strategy drives the highest appointment confirmation rate. The high confirmation rates delivered by the recommended weekly and daily timing combine with the patient convenience of a three-hour lead time to make 3-3-3 an ideal reminder strategy. While the strategies explored here represent a wide array of healthcare specialties, confirmation rates vary from specialty to specialty. For example, dental practices regularly see confirmation rates above 80 percent, though many medical specialties peak closer to only 60 percent. These differences are important to consider when evaluating confirmation rates for a specific practice. Analysis has not shown that patient demographics change the recommended timing and frequency of the optimal reminder strategy. Be responsive to patient feedback and adjust your global, or even individual patient, settings as needed.